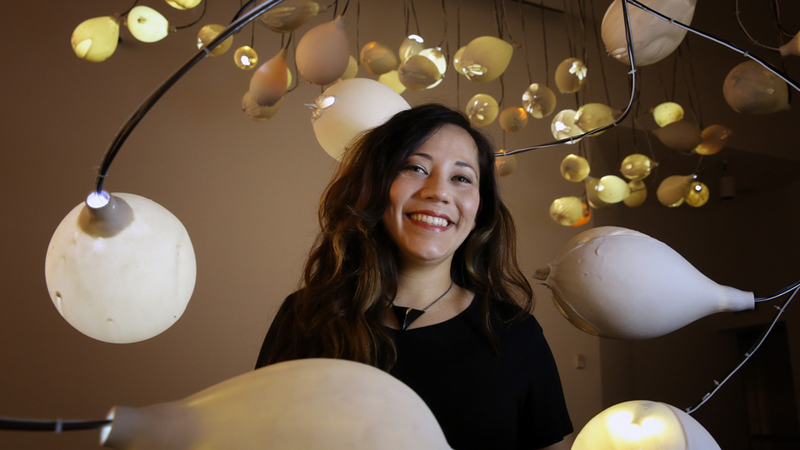 Brute strength, 90 LED bulbs and nearly two decades of creative visioning have earned Johnson County Community College Fine Arts Professor Angelica Sandoval a prestigious honor from Kansas City’s Kemper Museum of Contemporary Art. The Kemper named Sandoval one of five “Women to Watch – Metals” and is exhibiting her work, “Empyreal,” from June 2017 through January 2018. This biennial series is co-sponsored by the Kansas City Chapter of the National Museum of Women in the Arts (NMWA). The glowing installation — her largest — consists of 90 pieces made of steel rods, porcelain slip and LED bulbs. The work of five local female artists chosen to watch in the metals category include exhibits of jewelry, flat pieces and sculpture, but nothing as extensive as Sandoval’s. Her next step in evolving her art concept is to create and apply sound to her installation, as well as have dancers interact with it. Sandoval’s light installation will be at the Kemper Museum until January 28, 2018. If she is chosen to represent Kansas City, she would create an installation for the National Women’s Art Museum in Washington, D.C., which would be showcased beginning next June. See what our students are doing with their creativity on the third floor of the Student Center or in the lobby and cases next to ATB 115.